How to avoid workplace accidents. According to the records kept by medical establishments throughout the United Kingdom there are more than two million people injured on their jobs each year. Employers lose money when their employees are injured on the job, and employees lose money, and sometimes their lives because of these work related accidents. 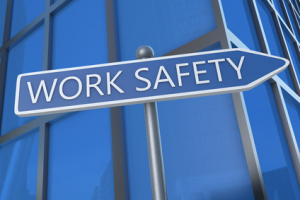 The Health and Safety Act establishes guidelines that help to assure that all workers in the United Kingdom have a safe work environment. Employers who want to make sure their employees are not injured on the job and ensure a work accident claim isn’t brought against them should consider the most frequent types of accidents that are reported, and ways they can prevent those accidents from happening on their job locations. The number one way that employees are injured is by slipping tripping and falling. Slips and trips and falls can be caused by clutter on the floor, loose carpeting or tiles, or wet floors. Slips and falls that cause the greatest injuries are the ones that happen when employees trip and fall down flights of stairs. Reducing trips slips and falls from clutter is simple. Have each employee keep their work area clean. Provide them with enough space to store everything so nothing is left sitting on the floors, or stacked around desks. To prevent people from falling because of worn carpeting or tiles make certain that the maintenance crew does a thorough inspection of all floor surfaces on a regular basis. Have them repair any problems they find with the floor as soon as the problem is noticed. To prevent people from falling due to wet floors you can implement a schedule where mopping is done with the least amount of people will be in the building. You should put signs out warning of wet floor conditions, and you can make sure that every employee knows to clean up spills as soon as they see one whether it was their spill or not. To prevent trips and falls on stairs makes sure that the stair wells are properly lit at all times. Have handrails that are secured properly to the wall, and check the stairs often for loose boards. Burns can range from minor inconveniences to major life threatening conditions. All employers who have anything in their businesses that could cause a burn should carefully train the employees that will come into contact with hot surfaces or open flames. Make sure that all employees wear proper clothing and footwear. You want your employees to wear rubber soled shoes that have closed toes. They should wear clothing that fits properly because loose clothing can be swept into a flame. Have periodic training sessions to make sure that every employee knows how to use all heat producing equipment. Have fire extinguishers placed strategically around the work place and make sure that every employee knows where the extinguishers are, and how to use them. Provide hot mitts and protective clothing to help reduce the possibility of burns. Discourage horse play and rough housing in areas where open flames or sources of heat are located. Restaurants and food service establishments are places where cuts are frequently reported. The number one way to reduce the number of cuts in these types of establishments is to have trained staff using the knives. You can also make sure that each staff member knows to wear non-slip shoes, and that they do not play around while they are in the kitchen with the knives. In any work area that has sharp instruments, or in work areas where materials like tin are used the employer must make sure that all employees are properly trained so they know of the dangers. Repetitive strain injuries cause strains, sprains, and conditions like carpal tunnel syndrome. The best way to prevent these types of injuries is to make sure the employee takes adequate breaks from the activity at regular intervals. You should also make sure the employees are provided with equipment designed to lessen strain. The main cause for heavy equipment accidents is an operator that was not paying attention. You must make certain that all employees that are going to be operating heavy equipment are properly trained, and that they are tested to make sure they can properly use the machines and the safety equipment on those machines. You must also make certain that the equipment is kept in proper condition so that it is safe for your employees to operate. Have all operators of heavy equipment pass a vision and hearing test each year. Make a policy that all operators of heavy equipment will wear safety equipment like hard hats, and do not allow operators to have radios, MP3 players, or cell phones on when they are working.